William Gibson can write. There isn’t anything stale or cliche about the prose in “Burning Chrome” (1982), even thirty years down the line. 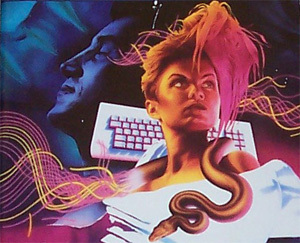 Nevertheless, it took me three weeks to get through this story, which takes place in the same universe as “Neuromancer.” This was due in part to me not really bonding with the characters, a couple of computer hackers using cyber-technology to break into someone’s computer system to steal all her money. The tone of the story, and the attitudes of the characters themselves, had a slightly misogynistic, rapey feel that I think it was affected to give the story an “edge.” This seems especially true considering how the victim of the hacking, Chrome, ended up at the story’s completion. But I also had a response to this story similar to other science fiction eras I’ve read that’s less justified. In fact, I felt it was downright unfair: thirty years later, software pathways rendered as a kaleidoscope of visual landscapes, which Gibson invented, along with the term “cyberspace,” has been copied and expanded on and eclipsed by his imitators (and by actual computer software) so many times, you feel unmoved by it. Which leads me to the quotation at the top of the post. Every story, ever piece of art, becomes dated sooner or later. But I think in the case of science fiction, that expiration date comes sooner than other forms of literature, and it’s endemic to the genre: speculative fiction about science, technology, or the future bumps its head up against actual science, technology, and the future again and again, and fact renders fiction either quickly obsolete or a naively quaint pipe dream. And any universals in your story–the emotional core that anyone can relate to across time or culture–can get lost in the noise of the dated details. So science fiction feels compelled to stay young and fresh in order to keep people’s interest. Not unlike the angsty character of the next story. Pat Cadigan‘s “Pretty Boy Crossover” (1986) is about one night in the life of a sixteen-year-old club boy known only as Pretty Boy. Pretty Boy lives and thrives on the attention he receives in the clubs, but he also knows that attention is fleeting. He is trying to decide whether to do as another friend of his did, “Cross Over” into a digital existence where he will remain pretty and adored forever, or at least much longer than he could hope to as a physical person. We don’t know exactly what this digitized existence entails, other than being an interactive program on the giant screens of the clubs. Would his “soul” survive, his mind, himself? He’s not sure, and he’s not even sure if that even matters to him. The people who would be performing the procedure try to convince him it would, and even let him converse with his “crossed over” friend. I found Pretty Boy a sympathetic and compelling character. You want to shake him and hug him at the same time for even considering something as dodgy and uncertain as this, especially given the smarmy, self-serving motivations of the people trying to convince him to do it. There’s something of the desperate soul of science fiction in Pretty Boy’s story, which makes the ending interesting Meta. The “Cyber,” and the “Punk,” here is more subtle: the cybernetic acoustics and punkishness of rock and roll viewed through the eyes of an Muslim Arab photographer sent to the United States to get images and an interview with an American rock star known for his outspoken politics. The story is a scathing criticism of the interconnected systems of Capitalism, American foreign policy, and the marketing of the U.S.’s own self-criticism that make true self-examination almost impossible. Except for a few historical details about the future that tell a different story from what actually happened (see above re: endemic datedness of sci-fi), this story barely reads to the contemporary eye as science fiction much at all. It reads like an Op-Ed piece in a Middle Eastern newspaper written in the actual, not fictional, twenty-first century. Eerily so. A fantasy of what America could become based on an analysis of those aspects of our culture that haven’t changed in twenty-five years.